Posted on Mon, May 9, 2011 : 10:28 a.m.
Ann Arbor's effort to build a multimodal transportation hub on Fuller Road got a $2.8 million boost this afternoon when federal officials announced funding toward its development. The grant — given as part of what was touted as a "major announcement" this afternoon in Detroit with U.S. Transportation Secretary Ray LaHood — will be used toward completing a preliminary engineering and environmental study at the site, just north of the University of Michigan Hospitals. Ann Arbor's Amtrak station is the busiest stop in Michigan. Completing the engineering and environmental studies will bring all of the entities involved in the transit center another step closer to fulfilling the $100 million vision for Fuller Road, said Eli Cooper, transportation program manager. The city already has designed the transit center with partners that include the University of Michigan, Ann Arbor Transportation Authority and state and federal transportation officials, Cooper said. Those plans have been through city planning and the first phase could be in front of City Council in the coming month. The first phase of the plan includes a 977-space parking deck, bicycle parking and space for bus passenger drop-off and pickup. The next phase includes a new bus and train terminal, and an early step toward that involves the site work that makes it eligible for future funding, Cooper said. Today's announcement makes that possible, he added. "This is so very important," Cooper said of today's announcement, which also includes $196.5 million toward improvements of the railway between Dearborn and Kalamazoo. Mayor John Hieftje agreed, saying that the funding increases the likelihood that there will be more federal support for this Ann Arbor transportation project. "If you look at the history of the Federal Rail Administration funding, they're putting a stake in the ground here," Hieftje said. The improvements will make increased commuter rail use possible, Hieftje said, which in turn will have many regional benefits. "If we can get that going, we're going to experience the effects of transit-oriented development (in Ann Arbor and Ypsilanti)," he said. 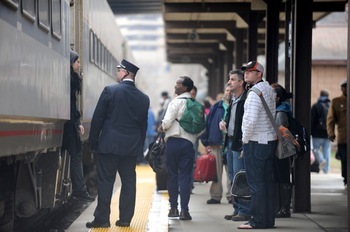 The Ann Arbor Amtrak station is the busiest in Michigan, according to recent reports. However,the single track at the existing facility means that trains can block other service. A new passing track would be built as part of the new train station, increasing capacity along the Detroit-to-Chicago line. Rail improvements will allow trains to travel at 110 mph for the 235-mile stretch of track, according to a news release. The funding coming to Michigan is being announced as the government releases $2 billion in transportation funding, following $10 billion in requests for that funding. The money is from Recovery Act funds, according to a news release from Sens. Debbie Stabenow and Carl Levin. The money had been granted to Florida, but it was rejected by that state's administration so it became available for other projects. According to the news release, "Michigan will also benefit from $268.2 million in funding for the purchase of 48 high-speed passenger rail cars and seven high-speed locomotives for service on eight corridors in Michigan, Illinois, Iowa and Missouri." Initial reaction to the news includes concerns from an Ann Arbor group called "People for Ann Arbor Parks." According to a news release issued Monday morning, the group says it welcomes new funding for higher-speed and more reliable rail service. However, the group also raises concerns about the location of the transit center on Fuller Park property. "There are reasonable alternatives to the use of a part of Fuller Park for either a very large parking structure or a passenger station," according to the release. "... (M)ajor modification and expansion of the existing station site (on Depot Street) are feasible, but have not been evaluated." Tue, May 10, 2011 : 4:21 p.m.
Wow, something is amiss here. The overwhelming majority of comments are against this site to be used for this new station (which is really only going to be a parking structure for U of M). I happen to agree completely, this is a horrible site for a train station. YET THE FEATURED COMMENTS WITH DOZENS OF PRO-VOTES ARE ALL IN FAVOR. Whats up with that? Not cool. Tue, May 10, 2011 : 11:01 a.m. Seems like a regional transit center should be located near the freeway. That is, if it's to make any sense. Fuller Road location is not convenient to anyone but UM north campus and the hospitals. This will increase local traffic and increase congestion. I am puzzled. Why is this a good idea? Tue, May 10, 2011 : 1:22 a.m. Puts a stake in the ground for $100M? How about a stake through the heart of taxpayers? Paid for with recovery funds that we have to borrow? Funds we don't even have. I guess why worry about a budget deficit when you can print money that becomes more and more worless with every dollar we print. Why do you think oil is so expensive? It's paid for in US currency. The less our currency is worth the more per barrel we pay, the more we pay for everything! Saudi Arabia and other producers say they can supply more than enough, usage is down so it is obviously not demand that is driving oil prices. For such an educated population we sure don't use our heads. I'll just be poo-pooded by all the &quot;let's subsidize mass transit&quot; folks. Somehow this will work better than Amtrak I guess, because the trains stations will be architecturally pleasing. What if we don't work in one of the cities on the rail line? Which most of us don't. The rest of us slugs get to watch the budget deficit ballon while we spend our tax dollars to subsidize your seats on the new train system. Must be nice to have the working class take care of the new ruling class. Tue, May 10, 2011 : 12:06 a.m.
Am I the ONLY one that thinks $2.8 million is a lot of money to &quot;be USED TOWARD completing a preliminary engineering and environmental study at the site&quot; But then this area has a reputation for spending tons on studies! Mon, May 9, 2011 : 11:54 p.m. Sorry I missed something. Who is putting up th other $97.2 million. Has anyone remembered that last year the federal government had a $1.6 TRILLION deficit? My guess is when the new debt limit increase goes through many of these vote buying projects will disappear. But you never know what a Senator up for relection will offer. Mon, May 9, 2011 : 11:28 p.m.
After watching too many action movies and reading too much of the newspaper.... and thinking about how security is changing in this country (since the proposals look at 10/20/30years down the road) Is it in the best interest of security to put a train station (which may eventually require airport-like security): Next to a massive hospital, next to a river that provides 85% of our drinking water, and next to a huge parking lot????? Build the transit center, but not next to the hospital and river. Mon, May 9, 2011 : 11:23 p.m.
You forgot a couple more questions to ask your council members regarding their upcoming vote for this project: 1.) How many council members such as the mayor are employed by the U and can honestly say they will feel absolutely no conflict of interest when they vote to contribute $10 million plus for this project? 2.) How exactly did we get so far down the track ($1 million plus already spent) without any official council vote approving this project? Whatever happened to the open meetings act, or does everyone have ESP or something? 3.) As stated previously, how did you write the federal grant request without the city officially voting to approve this project? 4.) How confident is the city attorney about the legality of this effective land transfer and the city's ability to defend their position in court? Mon, May 9, 2011 : 11:14 p.m.
Why don't we hear a comment/quote from Amtrak? I'd like to know their opinion on this. Although the speed limit will increase, how often do trains approach the current speed limit? That is, will they be able to actually go that fast for long stretches? Will we have accidents/deaths from people on the tracks near the arb? Who will police the area? As it is right now, part of the area is run by the DPS, part of it is by the train police, and another by the city police. Will the agencies become much more communicative and connected, thereby responding to calls more efficiently? Will the idling trains disrupt the wildlife in the river? Will the oil from the cars flow right into the river? What does Norfolk Southern (NYSE:NSC) think of this? If they endorse this, what would &quot;social responsible investors&quot; think of NSC? Will phosphoric acid be banned completely from parking lot cleanups/cement reconstruction at the UofM? It would be a shame if any phosphoric acid (EPCRA) went in the river. Here's a good test. The first time someone drives to the parking structure and needs to use it for the train station, or go for an eco-friendly walk along a concrete jungle located next to a river: If the parking lot is full -- then it is a parking lot for UofM employees. If there is an available spot for the public -- it's a transit center near a river. Mon, May 9, 2011 : 10:42 p.m.
1) After U of M's parking structure is built, how long after will we know whether this will be a train station or not? 2) Is this really a &quot;demonstration&quot; project, like you were denied funding but decided to go ahead anyway? 3) How much money have you ALREADY spent on this, even though you've &quot;never known&quot; (in quotes because they knew they were going to do it from the beginning despite lacking necessity or feedback) if it was going to happen? 4) Why is the Fuller location better than where there's already a station and big abandoned lot? 5) Since this is such a huge project and so expensive, and you're already cutting police and firefighters and trying to get an income tax going and talking about the ire budget gaps Ann Arbor has, what evidence have you compiled that this will actually make any money for the city? And what is the timeframe given in that evidence? 6) Why did you decide to go ahead with this even after you were told it was not justifiable? 7) Is it really true that Amtrak has said all it needs is 75 more spaces over the next 10 or 20 years? How can we justify 40 million for 75 spaces over 10 or 20 years? 8) No matter HOW ridiculously optimistic you might be about the transportation needs and gluts of incoming workers, is NOW really the best time to get ready for people who'll want to commute here in 30 years? 9) Since it seems like no matter how lacking in evidence you are that this is needed, is there anything that could happen that would make you stop spending money on this? You'll find that the answer to 9 is no. And how good an idea is that in the face of ALL evidence to the contrary, they're going to do this anyway? The new 50 million city hall wasn't enough, apparently. This is ABHORRENT. Tue, May 10, 2011 : 4:05 p.m.
Mon, May 9, 2011 : 10:36 p.m.
Tue, May 10, 2011 : 2:08 a.m.
Mon, May 9, 2011 : 11:59 p.m.
Mon, May 9, 2011 : 11:05 p.m. The proposed train station does not appear to be much bigger. . .
Mon, May 9, 2011 : 8:23 p.m. I'm sure this could be a wonderful thing; however how many decades and millions away? They can't even afford to fix the potholes. Look how long it's taken for the Stadium Bridges, or a new international bridge. Will the state, local and federal budgets really continue to support this? Mon, May 9, 2011 : 8:17 p.m.
Is $100 million an incorrect title? I thought it was $43 million? How do we get an increase of $50 million? Was a $50 million donation allocated to this? Mon, May 9, 2011 : 11:57 p.m. I'm sure the extra $ 50 mil will be funneled back into the politcians reelection campaigns. Mon, May 9, 2011 : 8:16 p.m.
AnnArbor.com, when is the announcement supposed to happen? It's now after 4:00, and you're still running this &quot;advance&quot; story. Mon, May 9, 2011 : 7:14 p.m.
A reminder to please refrain from attacking other commenters. Mon, May 9, 2011 : 8:01 p.m.
We're attacking the voting system. I see the back-end of databases, where I as the administrator can up the popularity of an entry from 4 to 40 with a keystroke. Mon, May 9, 2011 : 7:09 p.m. I am shocked, shocked I tell you, to hear that there may be commenters here on annarbor.com who may have an agenda! Ann Arbor needs a multiuse Transit Center…of this there is no doubt. However, Fuller Road is the wrong location for several reasons (most already discussed above). At Fuller Road you would be starting from scratch…guaranteeing a much higher cost than if you redeveloped the existing Amtrak station site. The original railway passenger station also included a medium size freight yard with multiple tracks. So, the space already exsists for a passing track(s)…and a parking structure…and a new station to replace that god-awful monstrosity that has been an embarrassment since it was built 40 years ago. Mon, May 9, 2011 : 6:57 p.m.
@Deb... Your observations about certain others here are more spot-on than you realize! Mon, May 9, 2011 : 6:52 p.m. The &quot;net&quot; revenue change to the city versus the existing parking deal at the Fuller surface lot has never been clearly articulated by the city. In addition, there have been previous statements about reducing the number of spaces on the north side of Fuller next to the pool. Since parking revenues are helping to supplement the general fund these days, it seems more information should be made available to the public on these numbers. Mon, May 9, 2011 : 6:50 p.m. So, just like I figured... they're going to spend a couple hundred million fixing-up the tracks, so the choo-choos don't fall-off, and throw a couple million in the kitty for the Big U's new parking structure, errrrr... train station, and buy a few dozen new locomotives and train cars that don't break all the time. It does sound like we have to share those with some other states, though. This is basically taking care of some deferred maintenance and equipment upgrades. There are no billions for so-called high speed rail, and there never will be around here. Obama is throwing a bone to his fans, hoping they won't notice. Mon, May 9, 2011 : 5:45 p.m.
Mon, May 9, 2011 : 5:26 p.m.
Tue, May 10, 2011 : 1:36 a.m.
Not necessarliy a good thing for Michigan. We have to put up our funds and pay for overruns and deficiency caused by lower than expected ridership. Mon, May 9, 2011 : 5:20 p.m.
Mon, May 9, 2011 : 5:10 p.m. The large DTE property across the tracks from the existing Amtrak station would make an ideal alternative location. The current surface parking lot could be expanded. Just add a more convenient pedestrian bridge over the tracks and you can update the current station at a fraction of the cost of the Fuller Rd. location. Local businesses on Depot St. and Lower Town would also benefit from the existing location versus the Fuller Rd. site which has no retail development possibilities. Mon, May 9, 2011 : 4:52 p.m. If I am not mistaken, the City Council has not yet voted on final authorization to construct the Fuller Road Station. Does accepting this grant obligate the city to build it? Further, do the grant funds apply to Phase I (the parking structure) or does acceptance of the money obligate the city to the full construction of a train station, without any guarantee of further Federal funding? Mon, May 9, 2011 : 4:40 p.m. This is a joke. It is a waste of tax payer money. If the U wants a new parking structure they should pay for it. Looking at the plan, how many parking spots the U gets, and how many parking spots are available at the old train station shows why. The city will only acquire about 50 additional spots then the currently available amount at the train station. Now they want to add a bus terminal to the same station, that should eat up the additional spot allotment pretty fast. This is nothing more then a parking deck built for the U. As for a new rail (so trains can pass), couldn't we add one to where the station already is? Could we not look at making that station bigger? There is no reason for the city to build 700+ parking spots for the U. They have there own money and with 26,000 visitors a day, i am sure they can afford it. Why are these projects combined, other then to give the U land to build a large parking structure for the hospital? If we really want a new &quot;terminal&quot;, tear down the old one, and build it in that spot, or another place where the city (and apparently national) taxpayers aren't subsidizing a parking lot for the U.
Mon, May 9, 2011 : 9:27 p.m.
phoasti, It is the cities land. Donating it so that it can get 50 spots and the U 700+ is basically a subsidy. The U is not paying for the land. The subsidy has nothing to do with the actual construction cost. Mon, May 9, 2011 : 8:09 p.m.
Mon, May 9, 2011 : 7:41 p.m.
deb, a person who acts as a guide at a museum is spelled &quot;docent&quot;, not &quot;dosent&quot;. /thought it was a typo until the third consistent use. Mon, May 9, 2011 : 6:36 p.m. The U of M already parks cars on the property through a previous agreement, so I don't have to &quot;take it into account when (I) do (my) math.&quot; I am not saying that $9.5 million (22% of $43 million) for something &quot;that dosent increase the amount of parking for amtrack... and leaves 50 spots to the city to charge for&quot; is a good deal, but argue on that merit. The U of M is paying the same price per parking spot as the other parties in the deal. Mon, May 9, 2011 : 5:39 p.m.
George, Sure, i just am sick of paying for the U. I am open to alternatives. Mon, May 9, 2011 : 5:38 p.m. I would say a 900+ spot parking structure that (on land that the U dosent own, and will be donated by the city), that dosent increase the amount of parking for amtrack, (a station that dosent exist and may never and the 150 number is right about what amtrack has now at its current location) and leaves 50 spots to the city to charge for. (which the city could have just by reclaiming the parking lot that is already there and lets the U use) How is this not just for the U? What is the city benefit? I am not sure what the costs of the land are now, or if the city leases the land to u of m, so if you feel like doing more calculations, you may be able to show me how the 50 spots will make this a good investment. I mention the lease above (if it exists) so you can take it into account when you do your math. Mon, May 9, 2011 : 5:33 p.m.
A better location for an Ann Arbor regional transportation center would be directly across the tracks from the present Amtrak station on the recently vacated DET property between the rails and the river. It is the only place where both the north-south and the east-west tracks could be served by one facility. There is ample room for parking. Is is more centrally located between downtown, central campus, and the medical center. If some of the river front property where the north-south tracks cross Main Street and the river is included, then there will be a real opportunity to create a worthy gateway to our city along Main Street and US 23 to the north. Mon, May 9, 2011 : 5:29 p.m.
Mon, May 9, 2011 : 4:20 p.m.
Actually this site has been a paved parking lot for 20 years. It sits at the base of the hospital complex next to the railroad tracks way across 4 lanes of traffic from the Fuller Pool. Way back then the UM let the city put a road through their land to save 5 acres of very old oaks from being cut down on city land. In exchange the City said they could pave this spot for much needed parking at the hospital. Since then the hospital has grown and grown, 25,000 people go there every day. The transit experts have said it is the best place for a station in SE Michigan that's why MDOT applied for the money. This will have tremendous benefits for the whole region, for transit and importantly, for the environment. Mon, May 9, 2011 : 5:04 p.m. I think that it needs to be clearly stated, for the record, that the city agreed to a &quot;temporary&quot; parking lot in Fuller Park while the UofM was expanding the medical center and that that agreement was for 15 years, expiring in 2008, then renewed for another 2 years. There was never an agreement that this park should be used permanently for UofM parking. Mon, May 9, 2011 : 4:46 p.m.
Mon, May 9, 2011 : 4:45 p.m. I am amazed at the way you applaud every city decision, it makes me wonder where your allegiances lie. Mon, May 9, 2011 : 3:55 p.m.
Great to improve train travel! Alternatives to the location in Fuller Park should be considered. Details for Phase I show that the city has designed a 1,000 car parking structure to be located in a city park, effectively removing park land without the vote of the people required by our city charter as of November 2008. The parking structure will bring more commuter cars into the city, not less. There is no design for the train station at this time. The city should clarify its plans and all alternative locations. Tue, May 10, 2011 : 1:37 a.m.
Of course it's great when you're not paying for it! Mon, May 9, 2011 : 3:11 p.m. This has the potental to be a landmark structure in local mass transit. I would just hope that authorities are more careful than to allow this to become the next People Mover. The per passenger cost in administering the People Mover was and remains about $3.50 compared with about 20 cents per passenger for the New York subway system. With $1.00 fer passenger fares the People Mover became one of the great financial disasters in mass transit. The downtown Detroit trolley system, purchased from Portugal, also did not fare well and went out of business after several years of operation. The financing available and projected costs must be monitored carefully to avoid the problems that plagued the People Mover and the Detroit trolley system . Tue, May 10, 2011 : 1:38 a.m.
&quot;The financing available and projected costs must be monitored carefully to avoid the problems that plagued the People Mover and the Detroit trolley system .&quot; Same people who run our government so well? Mon, May 9, 2011 : 9:40 p.m. I would guess that difference in the cost of administering has to do with the amount of ridership. Way to compare NYC to DET. NYC is different from every other city in america. Have you spent much time in Manhattan?? Mon, May 9, 2011 : 2:46 p.m.